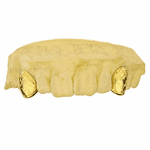 Custom gold grillz for teeth. 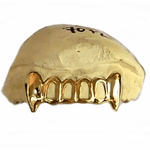 Authentic 10k gold & 14k gold custom grillz jewelry. 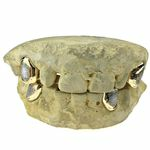 We also offer gold plated grillz for at a fraction of the cost of solid gold grillz. 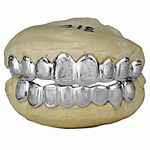 For those that prefer silver, we offer silver teeth grills, crafted with 925 sterling silver. 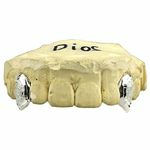 Our do-it-yourself mold kits for custom grillz are free with every grillz purchase. Do you like free? 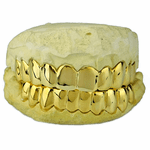 We got you covered with 100% free grillz shipping in the USA. 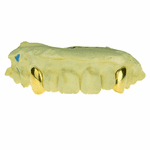 We ship 7-10 days from receiving your mold, so you can flex your grillz fast. Compare our prices against the other guys - then come back and save some money. Questions? We are happy to help! Contact us through email or call 888-664-1127. We have thousands of real 5-star ratings - over 12,000 reviews. Shop confidently! 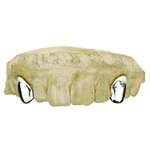 Step #1: After you order your custom grillz, we mail you a free do-it-yourself teeth mold kit. 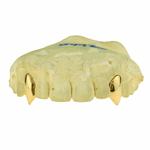 Step #2: When you receive the mold kit, you make an impression of your teeth & mail it back. 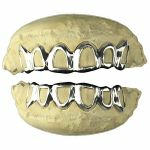 Step #3: Your grillz are made (7-10 bus. days) and shipped to you then you just snap them in! 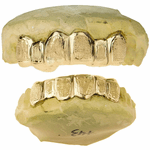 How Much Are Real Grillz? 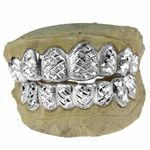 925 Sterling Silver Grillz = $25/per tooth. 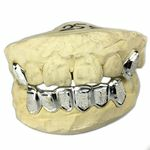 925 sterling silver is an excellent material for custom grillz jewelry, is incredibly durable, hypoallergenic, and is one of the most blingiest materials known to man. 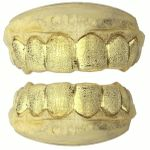 10K Solid Gold Grillz= $48/per tooth. 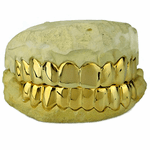 10K gold is a popular option for real gold grillz jewelry. 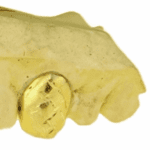 10K solid gold is durable and has a higher percentage of tougher metals in the alloy than 14k gold, making it more resistant to scratching and scuffing. 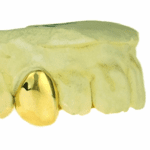 14K Solid Gold Grillz = $76/per tooth. 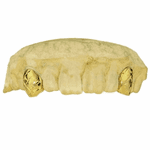 14K gold custom grillz have a higher gold purity than 10K gold, therefore it is more stunning with brighter colors, and is a desirable option for those that want more bling for their buck. *Custom fang extensions are extra. See individual listing for pricing. Deep-Cut Perm Style = $20.00. Deep-cut perm style grillz have deep lines between the grillz teeth, which makes the individual teeth look more defined to achieve a permanent grillz look. Gold Plating = FREE! 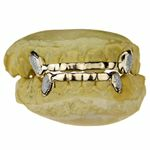 Gold plated over 925 sterling silver is a good choice if you are going for the gold custom grillz look, but don't want the higher expense of a solid gold grill. 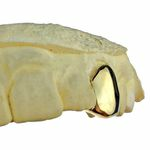 With gold plated grillz, a thin layer of gold is applied over 925 sterling silver metal. Diamond-Cuts = FREE! Diamond-cuts are notches and grooves applied to grillz that sparkle like a disco ball. Diamond-cuts are not diamonds. 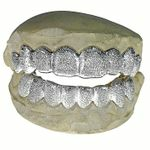 Rotating the grillz gives the appearance of dazzling diamond grill. Diamond-Dust = FREE! Diamond-dust in grillz is created with a special tool that produces micro nicks and cuts into the grillz and make the surface glitter and sparkle. Diamond-dust is not diamonds. 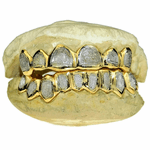 This technique gives the grillz the appearance of being covered with a very fine diamond dust. 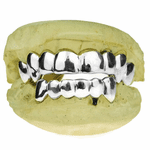 Our custom grillz are available in 925 sterling silver, 10K gold and 14K gold. 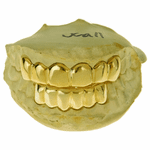 When you order custom grillz online, we rush you a free mold kit. Just send it back to us and we'll get right on it! 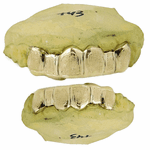 Custom grillz typically take 7-10 business days to make, once we receive your mold. 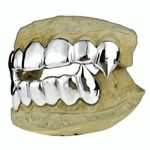 Can I get custom grillz if I have crooked teeth? Yes! We can make it happen even if your teeth are crooked or not perfectly straight. No extra charge. 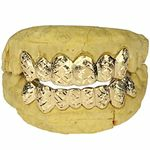 You want to make the right choice when shopping for grillz. 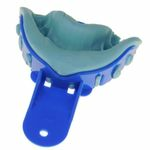 Rest assured, when you order our grills, you will be receiving a stunning mouth piece at a price that's hard to beat. 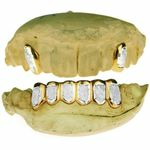 We offer high quality hand made custom grillz at super affordable prices (solid 10K gold, solid 14K gold and 925 silver). And as always, you get 100% FREE shipping in the USA. If you ever have questions, you can reach out to us 24/7 through our online contact form or by phone at 888-664-1127 to talk to a live customer service agent during normal business hours Mon.-Fri 10 am to 6 pm PST (that's California time). Be sure to check out what thousands of satisfied worldwide customers are saying in their reviews. Are your custom grillz permanent? Our custom grillz are made using an actual mold of your teeth, so they will be a perfect fit just for you! Our mouth custom grillz are nickel-free and lead-free, and are safe to wear inside your mouth. 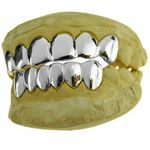 You should not eat, drink, smoke, or sleep with your grillz on and should not be worn continuously. If you experience any discomfort that you believe may be related to the grillz, discontinue use.